Liz passed away unexpectedly and peacefully during a short illness at the hospital. She was in the company of her Mom at the time. 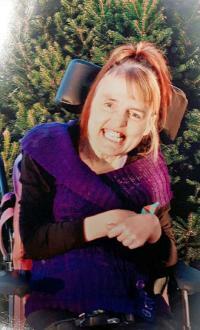 Liz coped with multiple special needs all her life, it was often a struggle for her, and she endured much pain. But much of the time she showed a wonderful personality with a bright smile, flashy eyes and huge hugs for anyone who came to visit her. She loved to sing in her own “special way” at church. Liz was a child of God, loved by many. For Liz, the best years of her life were when she lived in the Rehoboth Christian Homes community, her final 20 years. We thank all Rehoboth staff for the incredible love and professional care they provided Liz over the years, first at the Five Gables Home, and more recently at the Mayfield Home. Liz is survived by her Mom Jetske (and Joe Koopmans); siblings, Bert and Jenny (Peters), Tako and Henrietta (Dykink), Pauline and Jack (Dehaas), Ginny and Henk (VanderHorst), Wendell and Regina (Landwehr), Phil, Rita and Paul (Dekleer), and their families. Liz was predeceased by her father, Bert, and first mother, Truus. A Memorial Service will take place Saturday, May 27, 2017 at 1:00 pm at West End Christian Reformed Church, 10015-149 Street, Edmonton. In lieu of flowers, we encourage you to donate to Rehoboth Christian Ministries.